Some people will tell you that plastic decking and composite decking are the same thing, but there are a number of key differences between these two materials. For one thing, plastic deck boards are entirely artificial, whereas composite products are made by combining polymers with real wood flour, making them a kind of ‘semi-synthetic’ option. But which material is better? Both composite and plastic decking have the enormous benefit of requiring very little maintenance, but we at TimberTech UK believe that composite wood products are superior to plastic deck boards in practically every other way. Read on to find out why, or click here to order a free sample of our own composite wood decking. Not all artificial decking is created equal! Plastic decking is not a particularly green choice, whereas TimberTech decking is designed to have the smallest possible impact on the world around us. Our products are created using waste wood materials from the furniture industry - materials that would otherwise be placed into landfill sites. All TimberTech decking products come with a 30-year residential warranty, so you can rest assured that our decking is made to last! 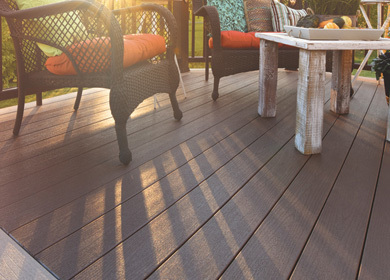 Plastic deck boards are hollow and can bow and crack underfoot, whereas TimberTech decking has a solid construction that ensures strength, stability, and a decades-long lifespan. If you’re thinking of buying plastic deck boards, it’s probably because you heard about their minimal maintenance requirements. 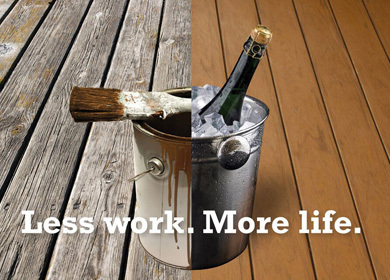 But TimberTech decking also requires practically zero maintenance – it may look like wood, but you’ll never have to spend time sanding or painting it. All it needs is the occasional jet wash. But Isn’t Composite Decking Expensive? It’s true that plastic decking is marginally cheaper than composite wood, but bear in mind that you get what you pay for. 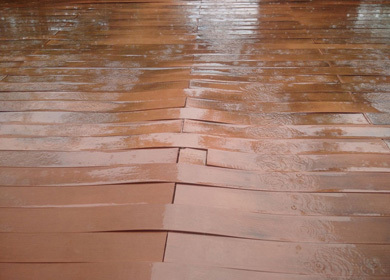 Plastic decking often has a cheap look, and the boards are prone to flexing and splitting. The chances are high that you’ll have to replace your deck before long, and so plastic decking is often – in the long term – a far less cost-effective choice. Although a little more expensive than plastic decking, TimberTech’s products are still an affordable option, and if you spend a few extra pounds in the first instance, you’ll get a quality product that lasts a long time and looks much nicer than other synthetic decking products. Invest in your outdoor living space for the long term! Stand out from the crowd with composite wood! Plastic decking usually comes in just one colour: white. But TimberTech’s decking range allows you to tailor your deck to your tastes, with many different styles and colours available (including Grey, Cedar, Tigerwood, and many more!) We also have a range of composite handrails in complementary colours, as well as integrated LED deck lights that will help you to complete the look. Why settle for plastic deck boards when you could have something that looks just like wood? Still not convinced? For more information about TimberTech’s wood composite decking, give us a call on 029 2080 3756 or email info@timbertechuk.co.uk. You can also order a free sample and see for yourself why TimberTech is so much better than plastic decking!